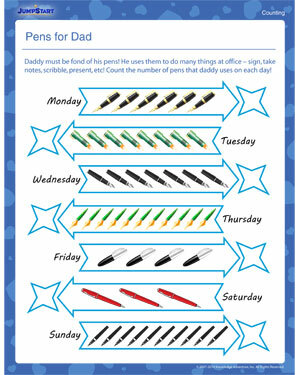 Dads use pens and laptops the most in their offices. Do you know how many pens they use in a day? He uses them to do many things at office – sign, take notes, scribble, present, etc! Count the number of pens, illustrated in the math worksheet, that daddy uses on each day. See and download more counting worksheets for beginners if you like this one!